This is not an original recipe, but where it originally came from I can only guess. Enjoy! 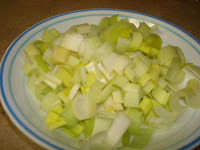 Halve the leeks and cut into 1/2 inch - 1 inch slices. Wash thoroughly. Pat chicken dry and season with salt and pepper. Heat oil and 1/2 tablespoon butter in a 10-inch nonstick skillet over moderately high heat until foam subsides, then brown chicken on both sides, about 4 minutes total. Transfer to a plate. Add half of chicken broth and all the garlic to skillet and deglaze by boiling over high heat, stirring and scraping up brown bits, until reduced to about 2 tablespoons, 1 to 2 minutes. 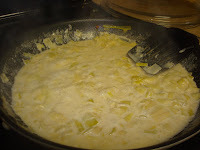 Add leeks and remaining 2 butter and salt and pepper to taste, then simmer over moderately low heat, covered, stirring occasionally, until leeks are wilted, about 10 minutes. Stir in rest of broth. Top leeks with chicken breasts and juices from plate, then gently simmer over low heat, covered, until leeks are tender and chicken is just cooked through, about 8 minutes . 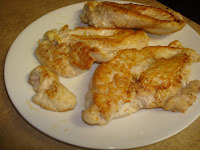 Transfer chicken breasts to a plate. Add cream to skillet and boil over high heat, stirring occasionally, until thickened slightly, 1 to 2 minutes. Add salt and pepper to taste. Serve with crusty bread or over rice.